Supporting local charities and philanthropic causes has always been a focus for Bonne Illig, owner of the private jewelry gallery VanBrock in Leawood, Kansas. Illig opened VanBrock in 2007, and as her business grew and her team expanded, she encouraged her associates to get involved in giving back to the community. Her associate Debbie Douville first learned about KVC Health Systems’ mission of helping children and families in 2013, and she expressed her desire for Illig and the entire VanBrock team to get involved with the organization. The partnership with KVC began when VanBrock hosted a Little Black Dress Party to raise funds and awareness for the 2013 KVC Annual Charity Gala. The women of VanBrock went on to chair KVC’s Gala in 2014, which raised a record amount of funds for children and families served by KVC. Illig and her team enjoyed the event so much that they requested to be the chairs again the following year. In 2015, they approached KVC with the idea to chair the Gala for four years and raise $1 million over that time. This year marks VanBrock’s fourth year chairing the KVC Gala, and they are determined to meet and exceed their ambitious goal. The Gala is an upscale party that combines gourmet food and drinks, entertainment and a unique auction to raise funds to enhance the lives of children and families served by KVC Health Systems, a leader in behavioral healthcare and child welfare. The private, nonprofit organization provides services to strengthen families, prevent child abuse and neglect, and provide foster family care and adoption for children in need in 30 Kansas counties on behalf of the Kansas Department for Children and Families. KVC also helps children and adults at its psychiatric hospitals such as KVC Prairie Ridge Hospital in Kansas City, Kansas and provides youth behavioral health programs at Niles in the heart of Kansas City, Missouri. Past Gala proceeds have helped create an Interactive Family and Adoption Center and made it possible for hundreds of foster families to attend KVC’s annual Resource Family Conference free of charge. For the last three years, the Gala took place at the Historic Firestone Building in downtown Kansas City, Mo. and inspired the event’s theme of Gala on Fire. The bright red “fire” colors throughout the two levels of the Firestone Building correlated nicely with VanBrock’s “ice” diamonds. 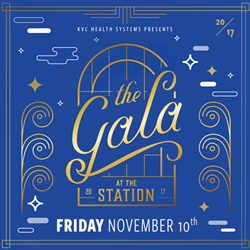 Planning is currently underway for the 2017 Gala which will take place on Friday, November 10 at the beautiful Union Station in Kansas City, Mo. A venue change was necessary in order to accommodate the event’s growing attendance, and the historic landmark shaped this year’s theme of Gala at the Station. The new location will also make it easier for party-goers to explore the space and discover food stations, purchase surprise boxes, bid on silent auction items, witness acrobatic performances, locate the dance floor and more. “The VanBrock team looks forward to chairing the Gala for our fourth year and raising $1 million to benefit children and families served by KVC,” said Bonne Illig, owner. Sponsorship opportunities are available and tickets are $150 per person with a limited number of discounted tickets available for young patrons under age 30. For more information, visit http://www.kvc.org/gala.